FILE - Procter & Gamble's Gillette shaving foam is displayed at a store in Chicago, Jan. 24, 2012. The company's new online-only ad has sparked calls to boycott. A Gillette ad for men invoking the #MeToo movement is sparking intense online backlash, with accusations that it talks down to men and groups calling for a boycott. But Gillette says it doesn't mind sparking a discussion. Since it debuted Monday, the Internet-only ad has garnered nearly 19 million views on YouTube, Facebook and Twitter — a level of buzz that any brand would covet. Gillette's ad echoes other attempts by major advertisers to take on social issues. Pepsi pulled an ad in 2017 showing Kendall Jenner giving a cop a Pepsi during a protest and apologized after an outcry that it trivialized "Black Lives Matter" and other protest movements. 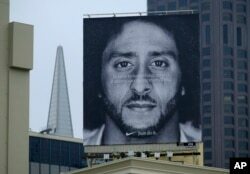 Nike polarized the nation with an ad featuring ex-NFL player Colin Kaepernick who started a wave of protests among NFL players of police brutality, racial inequality and other social issues. FILE - A billboard showing former San Francisco 49ers quarterback Colin Kaepernick stands on top of a Nike store at Union Square in San Francisco, Sept. 5, 2018. "Nike knew what they were getting themselves into," Torossian said. The ad with Kapernick was "making a lot of noise, and it can't be a surprise to [Gillette] that this is making a lot of noise." Pankaj Bhalla, North America brand director on Gillette, says the controversy was not the intended goal of the ad, which is part of a larger campaign that takes a look at redefining Gillette's longtime tagline "The Best a Man Can Get," in different ways. Another online ad features one-handed NFL rookie Shaquem Griffin.